If your Jeep rocks a soft top for the winter, and you do not have a garage, chances are you’ve walked out in the morning and found ice and snow clinging to your rear windows. Annoying, yes – but how you handle it will determine if that annoyance turns into a full-blown problem. Taking care of your soft top windows in the winter may seem like a common sense thing for many of you out there, but it is definitely a question we are asked here at Quadratec quite frequently this time of year as more and more new Jeep owners join the family. And the answer really isn’t difficult; you just need to be careful. First off, if you are wondering, it is perfectly ok to use a soft top in the winter. While many owners have dual tops and choose to throw on a hardtop in the winter, a soft top certainly does keep a Jeep warm enough during the cold months as Jeep heaters are pretty powerful and will get the inside toasty in a short amount of time. However, you do need to realize that you cannot treat your back soft top vinyl windows like regular glass car windows. 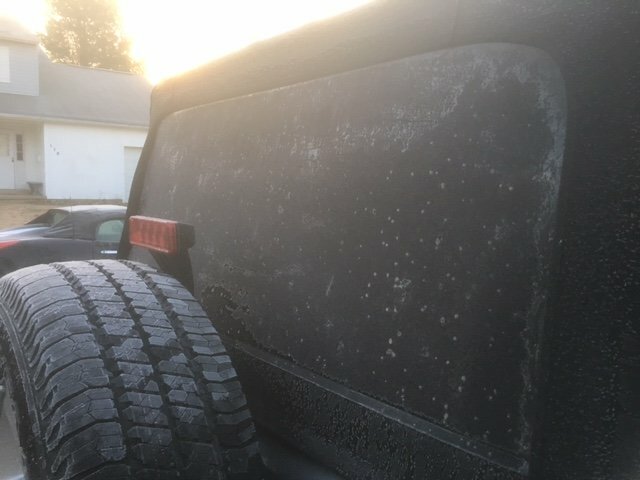 Bricker recommends definitely not trying raise or lower the soft top at all when the temperature approaches freezing as vinyl material loses its flexibility in colder temperatures. It is also unwise, he says, to roll-up your vinyl windows during the winter months, or even trying to zipper them open, as the plastic windows can shatter like glass when cold. Another thing to avoid is hitting the windows with your hands or arms in an attempt to ‘bump’ off accumulated snow. You may think the soft snow will just fall off, but instead you’ll probably puncture your window and end up having to purchase replacements. Finally, you’ll also want to abstain from pouring hot water on the vinyl windows as a way to melt off snow or ice. This may seem like a good idea, and will probably accomplish that goal, but chances are it will also crack the windows as well. What, then, is the best thing to do so you can remove that stuff off your windows and get on your way? We've had people tell us they use battery powered hair dryers on the windows to melt away snow and ice, and we've tried it out here too, but realistically the interior heater has the same effect in the same amount of time. Another thing some people have done is purchase cab or full covers, and place them over the soft top for the night. While this may work somewhat effectively, you still need to exercise caution each time the overlay top is removed. Smittybilt’s Bricker believes the best solution is the simplest. ”It’s best really to just turn the heat up on high when warming up the vehicle and allow the ice and snow to melt on its own,” Bricker says. This does call for a bit of pre-planning as you’ll need about 10-15 minutes for the heater to effectively do its job and melt off those impediments. However, if you are in a rush, or just forget to start the vehicle ahead of time (it happens to the best of us, don’t worry) then you’ll have to rely on the two side mirrors for visibility until the heater can do its job. These glass side mirrors can be scraped off – you may even have heated side mirrors – so you can get on your way pretty quickly; just remember to drive safely! Also remember, if you do happen to accidentally puncture those soft top windows, we can help. We have a full selection of replacement soft top windows, but keep in mind some tops will not accept aftermarket window replacements because of differing zipper counts. If this is the case for you, we stock great Smittybilt top replacements as well as other soft tops from all the best manufacturers.